"Frederick James Currier was born on February 13, 1860 in Wisconsin. As a young man, he was always looking for adventure. In 1894, Currier went to Oregon to purchase an apple orchard. Instead, he met two miners who were about to depart on a trip to Alaska to seek gold. They invited Fred to accompany them. The orchard idea was forgotten." Get the book to see what happened after that. Unethical trapping hurts us all. Use and teach ethical trapping methods. Check out our My Alaska videos! Heimo Korth is a legend amongst Alaskan trappers. Heimo has been living a (very) remote lifestyle for the past forty years. Heimo received ATA's Fabian Carey Trapper of the Year award in 2003, in recognition of his commitment and dedication to trapping. Heimo's sense of humor and engaging personality have won him friends near and far. 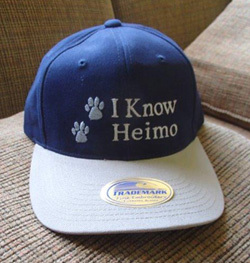 Back in the 1980s, some of those friends created ball caps with the slogan "I Know Heimo," which brought smiles to the faces of many in the trapping community. More recently, Heimo has become one of the featured cast members in the excellent reality TV show entitled "Last Alaskans." The program has brought widespread notoriety to our good friend Heimo. This seems like an appropriate time to resurrect the old slogan and share a smile with Heimo's new friends and admirers. Be the first kid on your block to wear one of our new "I Know Heimo" caps. Watch this wonderful new 2-minute video about the North American fur trade produced by our friends at TruthAboutFur.com. And be sure to visit their website and blog! For the past few years, a few of us have considered the idea of having an ATA "theme song". We investigated a few options. The best alternative involved creative Fairbanks genius Craig Compeau. Craig has been using well-known melodies and modifying the lyrics to fit his views. Many of the resulting songs are humorous criticisms of government. Others focus on life in Alaska. Everyone can agree that they are well done. ATA Director Dan Tempel heard a song that he liked and realized that the lyrics could be modified to tell a great story about Alaska trappers. We asked Craig if he could work his magic. Craig enlisted the aid of local singer Roger McGill. You can hear the result by clicking on the button below. We hope you like it. If you want to download the song, go to Craig's website: www.alaskansongs.com. Meet our mascot, Ben Wood. But we just call him Woody. "I belong to a sub-chapter of ATA. Some people call us a splinter group." The Alaska Trappers Association endeavors to preserve and promote trapping through trapper education and public awareness. Shared knowledge fosters responsible trappers and improves public understanding of trapping. The Alaska Trappers Association (ATA) respects the privacy of its members and customers and takes steps to prevent unauthorized disclosure of personal information to third parties, regardless of whether such information is received by e-mail, on-line forms, telephone, facsimile, mail or otherwise. ATA stores this information to enable it to mail monthly magazines or fulfill orders. Only employees who need access to personal information to perform a specific job are granted access. The website carries a Comodo CA Limited Positive Secure Socket Layer (SSL) Certificate, which enables security of private information. We also use a secure processing service for all credit card transactions. Financial information will be securely transferred to merchant account and banking vendors to process payment for orders. Our contracted printing company will be provided certain personal information to arrange for the shipment of monthly magazines. Unless required by law or by court order, ATA will not disclose, share or sell any customer information to any other third party without prior authorization.